Bright and stylish home away from home, recently lovingly rennovated by its owner. The house is furnished with modern, vintage and upcycled furniture and accessorised to a high standard to give it a boutique-hotel like feel. You will have the house to yourself, with its open plan lower floor, glass roof kitchen diner and private back garden. Upstairs there are two bright bedrooms and a generous bathroom. The house is 10 minutes walk to the sea and the North Laines. Situated in the community of Hanover in Brighton, the house is surrounded by brightly covered houses, sea and hilltop views and a pub on every corner! The house is the home of a designer and her family. A Victorian terraced house, which has been recently modifiend and extended to create an open plan lower floor that runs from the living room through to the glass-roofed kitchen diner with double doors that lead into a private South facing garden. Upstairs there is a generous sized bathroom with a roll-top bath and separate shower, along with two bedrooms (one double and one twin). If you want to spread out, there is also a double sofa bed in the lounge. The house has been accessorised with paintings, prints, 100% cotton sheets and towels, wool blankets and a fully equipped kitchen, including hand-painted stoneware dinner set that gives the house a boutique-hotel look and feel, yet you have the whole place to yourself! The house is available to rent for short and mid-term lets. Whether it be for a long weekend, a week away, a mid-term stay for work, or even inbetween houses. Fully equipped kitchen with glass roof and doors to garden Lounge area with burner-style heater Writing desk and home-office area Private garden 2 bedrooms (one double and one single/twin) 1 bathroom including bath and separate shower Wifi Dishwasher, washing machine, oven, gas hob, toaster, Nespresso coffee maker and full dinner service 100% cotton sheets and towels Hairdryer, iron and ironing board Hive wifi heating system and USB sockets The house is situated in an area with on street permit parking. Daily visitor parking permits are available on request for £5 per day. If you don’t have a car, it’s easy to walk into town or to the sea. If you like exercise the walk up the hill is great, if you are less keen after a long day, there is a frequent local bus that stops near the house. Really enjoyed our 4 night break. Very quiet & quaint street. In a great spot with some lovely pubs within walking distance. Thank you for all you help Lee. Lovely house in good location. This property was lovely from the moment we walked in through the front gate. The front of the house was well presented with a tidy front courtyard and clean white walls. This continued in to the house with minimalistic decor which worked really well with the house. Bare tiles and painted floorboards were a lovely touch. The house was well equipped with kitchen utensils, plenty of crockery, oven and fridge. A nice wooden table with adequate seating by the French doors was a pleasure to sit at with the sun shining though. The rear courtyard was nice and private and a real sun trap which I enjoyed in late afternoon. Both the bedrooms were of good size with comfy beds and storage for your clothes. Towels were provided and placed on the bed. The bathroom had a free standing deep bath and and a walk in shower. I would definitely recommend this property and I would certainly stay here again. Great house, we really felt at home! We stayed two weeks at the house and enjoyed every day! I highly recommend it! We absolutely loved our time at Stephanie's place on Windmill Street. The flat was very comfortable, and equipped to meet all our needs. The kitchen is THE BEST! It's close to Kemptown, the sea, the Lanes and the North Lanes. You'll love your time there. 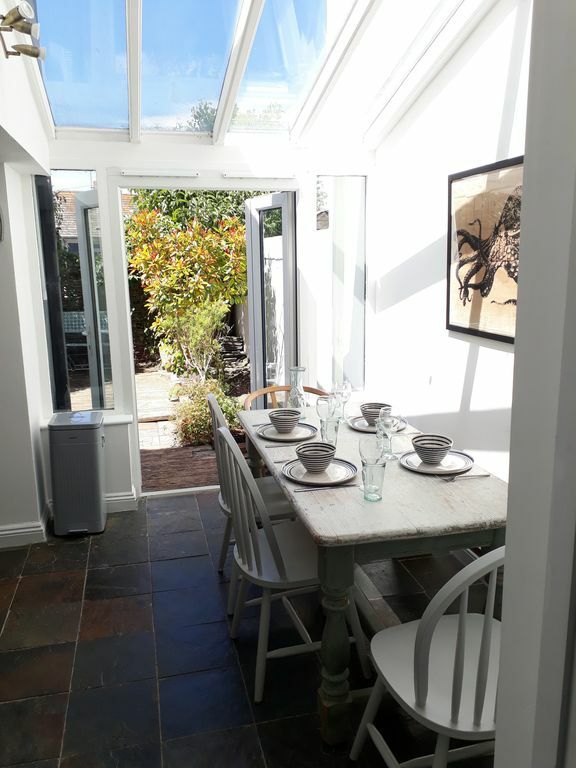 The house was beautifully decorated, as described and photographed, The kitchen was especially nice, well equipped with everything needed for a very comfortable stay and definitely conducive to sitting round eating, drinking and chatting. There were thoughtful touches, including good tips on local bars, cafes and delis. Lee, who manages the property was most helpful and on hand to provide parking permits etc. This is a very well located house for walking down to the centre. The only thing we missed was an extra mirror as the only mirrors are in the main bedroom and bathroom. Brighton is a cultural city by the sea. Just one hour from London by train and 30 minutes from Gatwick airport. It has a wide variety of great restaurants and cafes, local musems, unique shopping in the North Laines and plenty of things to keep the kids busy. You can enjoy festivals throughout the year: the Brighton Festival in May, Pride in the Summer and the Burning of the Clocks in the winter. The small village area of Kemptown is just a 10 minute stroll down the hill from the house, as is the beach. In the other direction you will quickly reach the Pavillion, the Pier the North Laines and the Station. Remember to keep some energy for the walk back up the hill! or after a long day, you can take also take one of the local buses. If you want to get out of town, the East Sussex coast is easily accessible by car, bus or train. On sunny or wind-swept days you can enjoy favourite spots at Beachy Head and Seven Sisters. Walk in the South Downs and enjoy the local villages and pubs of Firle and Lewes. Or venture a little further to the historic cities of Arundel and Chichester.